Today we decommissioned the Chapel of Reconciliation with stories, prayer and worship. It was bittersweet. Excitement and optimism about a future that requires the complete renovation of this part of the campus. Good memories of the Anglican, Catholic and Uniting Church community that grew up and was centered around this chapel from 1997. But also sadness about the way that collaboration started winding up fifteen or so years later. It was a big service, with people from all the stages of that wonderful ecumenical endeavor. I preached this sermon. Remembering that experience of the three denominational colleges coming together and working out how to live together as a single community while we each kept and developed our distinctiveness, I realized it was an example of “receptive ecumenism”. 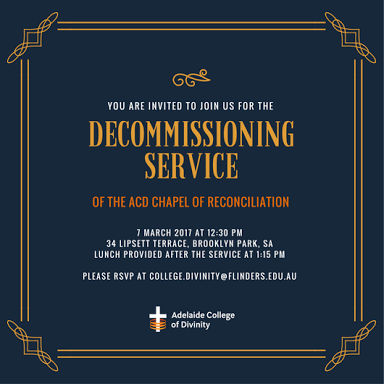 We worked together, ate together, told each other our stories, supported each other in difficult times, celebrated each other’s achievements – the campus in general, and the Chapel of Reconciliation in particular, became Space for Grace. Previous A Christmas reflection from Arthur Jackson… 53 years on.